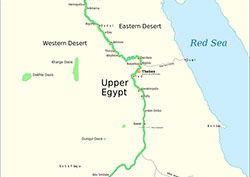 As agriculture depends on water resources in order to be successful, it is no wonder that the Egyptian civilization developed along the banks of the Nile River. The fertile soil deposited each year by the annual flood, allowed for a predominately dry, desert area to cultivate crops effectively and predictably for thousands of years. Out of Egypt emerged one of the first writing systems, hieroglyphs, and a strong political system that would endure for three thousand years. The three periods of centralized rule: the Old Kingdom, Middle Kingdom, and New Kingdom are periods of growth and often impressive architectural and cultural accomplishments. 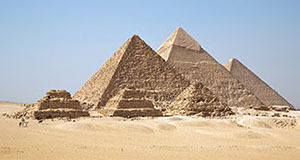 During the Old Kingdom, the Great Pyramids at Giza are constructed – one of the wonders of the ancient world. By the time of the New Kingdom, Egypt created an imperial system, ruling areas of the modern Middle East as well as regions to the south. Monumental temples, such as Karnak Temple, and tombs, like those in the Valley of the Kings, signify the wealth and power of New Kingdom Egypt. 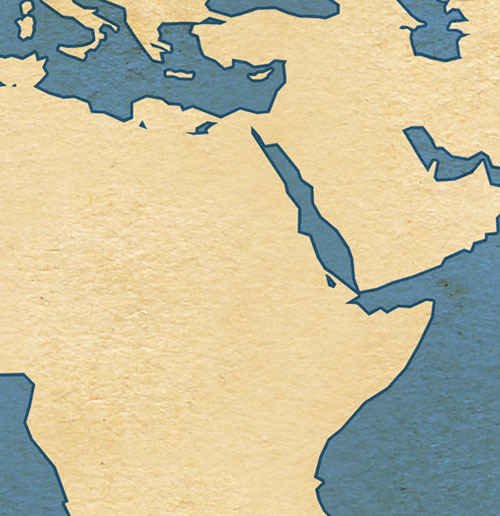 While Egyptian civilization continues into the first millennium BCE, a series of foreign invasions, including Nubians, Assyrians, and Persians, sets the stage for the conquest of Egypt by Alexander the Great in 332 BCE. The original political organization of Mesopotamia consisted of a series of city states ruled by a people known as the Sumerians. The Sumerians constructed monumental mud-brick temples known as ziggurats and developed one of the world’s first writing systems. The rising power of the Akkadians unified Mesopotamia, reaching a high point with the reign of Naram-Sin. Following a Renaissance of Sumerian art and architecture during the Ur III Period, a dynasty of kings from Bablyon rules Mesopotamia. Among the most famous kings of the Babylonian Dynasty is king Hammurabi (ca. 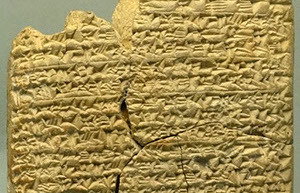 1792-1750 BCE), whose law code still survives today. A new imperial power, Assyria, uses improved military technology and strategy to create a large empire in the Middle East. 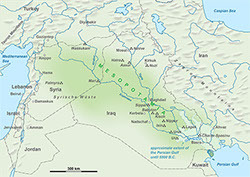 Prior to becoming part of the large empire of Alexander the Great, Mesopotamia is ruled by the Persian Empire.